Please Note: These questions are relevant to Amazon sellers and Accounting firms (who use A2X for their Amazon seller clients). When will these new plans be available? Available now. Please contact us at contact@a2xaccounting.com for access. Publicly available in late February. How do I know if I am currently on a COGS beta plan? What if I am on a current plan that doesn't have COGS beta turned on? No action required. If you or your clients don't need COGS or FBA stock valuation and are currently not trialing COGS beta, you can remain on the same plan. We will honor the current plans and pricing for existing clients. What if I am currently trialing COGS beta and want to continue using COGS? Please upgrade to a new 2018 Starter, Standard or Premium plan. The COGS beta period is ending and that functionality will be turned off in April 2018. It will take approximately 2 minutes to make the change to a new 2018 plan. What if I am on the Mini Plan and currently trialing the COGS beta features? Please contact us. The new 2018 Mini plan doesn’t have COGS functionality - continued access to the new features on the Mini plan will be by special arrangement. What if I am not using COGS, but would like to start using the feature? Please upgrade to a new 2018 Starter, Standard or Premium plan. 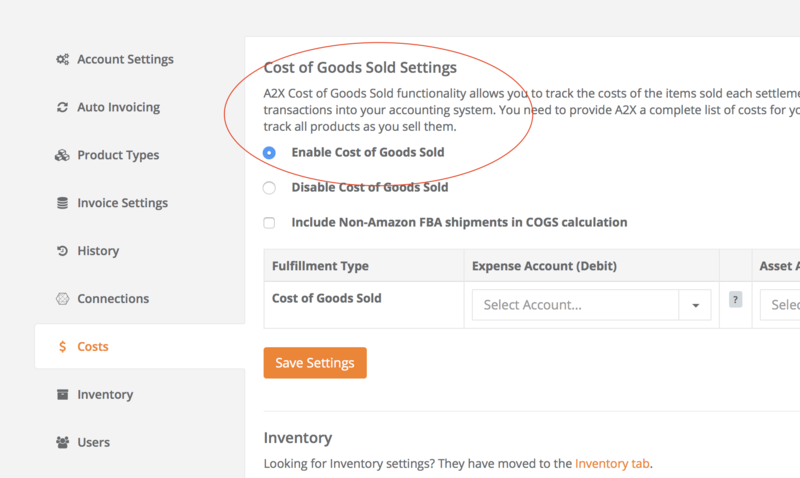 What if I would like to start using the FBA stock valuation functionality? What if any new clients I on-board have very low order volumes, but would like to use COGS or FBA stock valuation? Please subscribe them to the 2018 Starter plan, which is the entry level for COGS and FBA stock valuation. The new 2018 Mini plan does not include COGS and FBA stock valuation. How can I select an old or a new plan when adding a new A2X subscription? As of late February 2018 only the new plans are available for you to subscribe to. Will my coupon code still be valid after upgrading existing COGS beta plan to a new 2018 plan? Yes it will. When you change your plan any coupon code you have will remain in place. You DO NOT need to enter it again. What happens if I am on an existing plan but I need to change plans as my orders are too high for the current plan? The change will be made to the new 2018 plans. How do I learn how to use COGS and or FBA stock Valuation? In the first instance please refer to the following articles. If you require further assistance/training please contact us at contact@a2xaccounting.com and we will organize training for you.